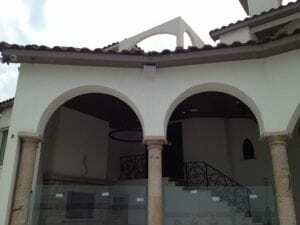 DRSTUCCOSD is a full service stucco contractor. Our main volume of work at the present time includes larger custom homes primarily in San Diego and surrounding areas. We also do work on homes and commercial structures of all sizes across Southern California. DRSTUCCOSD's expertise in the residential stucco industry translates into our commercial projects as well. Our Commercial work includes, but is not limited to the following; churches, small shopping centers, independent building/stand alone buildings, etc. The quality of our work is exceptional, with very few other contractors capable of comparable work. Our crew specializes in two different types of masonry finishes. One being a full 3-coat masonry stucco over lath finish, and the other being a 2-coat masonry stucco with a synthetic acrylic finish. Depending on the application, we can provide up to a 10 year warranty against cracking.